I was able to snag a copy of OnOne’s Perfect Effects 8 yesterday for quite the deal… free! It normally runs for $99, however, it is still being offered for free for the rest of the day today if you want to get in on your download. I have to say, it is well worth the download for several reasons. The interface is responsive, clean, and simple to pick up on even if you have never used OnOne products in the past. For me this is my first time using an OnOne product, I was able to hop on in and find my way around very easily. The learning curve is relatively low as long as you have experience in Photoshop to understand the terms within the Filter Effects (similar to blending options in the layers palette). Each Filter Effect becomes its own layer within Perfect Effects and allows you to stack multiple filters, I was able to make a killer preset for 32 bit HDR images, more to come on that! The ability to save presets is available. When you save a preset, it saves all of the stacked filters individually just as you were working. This makes it easy to return to the same workflow and make simple modifications as the presets will ultimately be different for each photo. (As a Photoshop Plugin) After pressing apply, it automatically opens your photo in Photoshop as its own effect layer! I really enjoy that feature the most as many other plugins make the effect on the layer you were working on. This simple feature makes for seamless integration with your current workflow. There are a ton of filter effects, this is a double edged sword! There may be two many filter effects. Some seem to be fluff, however they are just presets, you can make many very useful effects yourself. As a Photoshop Plugin, it does not show up in your Filter drop down menu. It is listed under File>Automate>Perfect Effects 8. Well worth the free download! However, I would have easily paid $99 for this software as well. It is well worth it because it integrates so well with my current workflow. I know this will make its way into my process and am glad I had the opportunity to check it out. I’m glad you found OnOne Perfect Effects 8 a good tool to use. I have the Perfect Photo Suite 8 myself and I like it a lot. But you know, I also have Topaz Labs Adjust and Star Effects and I also like them a lot too. These days when I’m post processing my HDR landscape images, I’m torn between using these tools. I always find myself having to pause for a moment and decide which tool to use would give me the best outcome of the image I want to produce. Tough decisions I’d say! 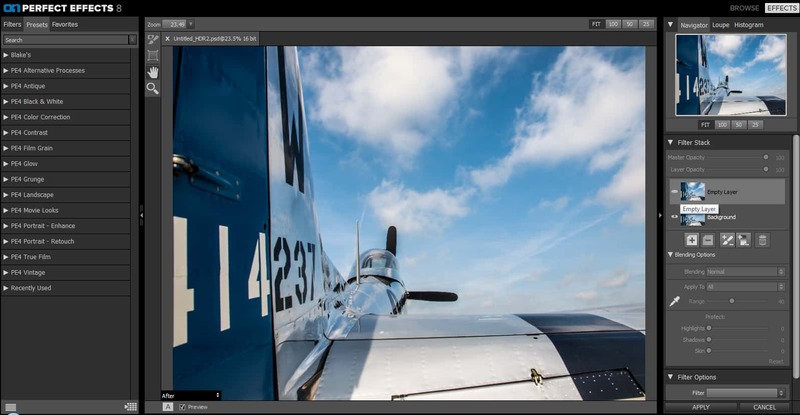 It’ll be nice to know what your thoughts are about Topaz Labs vs OnOne software for post-edits when you have had more time to evaluate OnOne software. Thanks! I do like it. I find myself using it a lot for various tasks. I will say that it is kind like a post processing buffet or smorgasbord rather than for one particular use. However it is extremely versatile. When it comes to Topaz vs OnOne, luckily I am not sponsored by either to say my opinion! They both have a time and a place in the workflow and I find using them in unison can only make your photos that much better!